The Rotary Club of Thurso are inviting budding engineers and willing competitors of ages 8 to 88, to participate in the Thurso Soap-Box Grand Prix, at 1.00pm on 8th September 2012, at The North Highland College. The idea is for individuals or teams to design and construct the fastest, most attractive and most entertaining free-rolling soap-box kart they can. All standards of manufacture are welcome, especially beginners. Engineering skills and driving performance will be tested on a time-trial track at the College. The event is also open to pedal-car drivers too, as we are aware that participants may already have such ready-made vehicles to run. The Pentland Firth and Orkney Waters in the North of Scotland will today confirm their place on the global marine energy map with the launch of the area as a Marine Energy Park. Energy and Climate Change Minister Greg Barker will welcome the launch of the marine park during a visit to Thurso in Caithness, where he is set to address key players from across the marine renewable energy industry. The Pentland Firth and Orkney Waters Marine Energy Park will incorporate the world-leading European Marine Energy Centre (EMEC) which attracts developers from across the world and where testing of a wide range of wave and tidal energy devices is already under way. and Orkney Waters. Many Gala night photos coming later. It will be difficult to choose something to see today with so many events happening. In addition the county is full of other things to do and see on today so get out and enjoy them. We will be at the HHlkirk Highland Games this afternoon and Wick Gala tonight - see some of you there. We hope to have photos of these two events going on to the web site on Sunday for those of you too far to attend. The county has been a hive of activity with preparations for all the events on today. Competitors and travellers from round the world have arrived for the Halkirk Games and many people are back home for Wick Gala. A train from the south will bring hundreds of Raith Rover supporters in to Wick for the big football game today. The Thurso Cinema, Scotland's most northerly cinema, re-opens today saving local residents a 109-mile journey to Inverness to enjoy the cinematic experience. The Thurso Cinema (on the site of the former All Star Factory) in Thurso, Caithness, has two purpose built auditoria with 250 seats in total. The plan is to install the latest digital technology and 3D equipment over the next few months so that by Christmas customers will be able to enjoy live opera, ballet, cultural and sporting events in 2D and 3D at their local cinema. New owner Rob Arthur also hopes to convert the existing bowling alley from the current 2 screens to 5 at a future date. A RARE weather window gave Wickers and visitors a golden opportunity to hear some excellent piping and drumming in the Market Square, last night. Dull, but mild conditions attracted an appreciative crowd of all ages for the extra-special massed display given by the Wick RBLS Pipe Band, Thurso Pipe Band and the Caithness Junior Pipe Band which delighted locals and visitors alike who were invited to a ceilidh at the Norseman Hotel after the hour-long performance compered by Wick band secretary John Bogle, who not only introduced the bands and their selections, but gave spectators a brief resume of their history. Lots of Caithness County Show Photos To Come On Sunday - Here are a few from the flower tent to start. The Hi-Life membership offers access to many facilities at reduced cost. Check out Highland Highlife other Activities all over Highland - HERE. If its wet then get even wetter and have fun - "Go Surfing". Caithness Now Famous For Surfing - Ever Wanted To Try? It now You Can! O'Neill Surf event event on the 14th- 15th July and 21st- 22nd July. So it will be over two weekends. Thurso Surf school will offer free O'Neill goodies with every surf lesson for a limited period over the summer. Surf lessons cost £35 and last two hours, that includes insurance, equipment and tuition. Catering for all abilities and ages as well as welcoming both individual and group bookings. So book something radical for the summer and learn to surf or improve your surfing with thurso surf and receive O'Neill freebies. Check out Wick Heritage Museum - the biggest museum in the north. Over to Thurso for Caithness Horizons Visitor Centre and Exhibitions. Call in at Lyth Arts Centre for the summer Exhibition and grab a coffee. Soon it will be Thurso Gala and Wick Gala for plenty of activities in each of their weeks. Don't be bored get out and join in. Get fit and errr play tennis, bowls, walking - who cares about the weather. You can only get wet and it's only water. Go for a CAITHNESS Seacoast boat ride - thrilling and see coastal wildlife - AMAZINGLY YOU DON'T GET VERY WET - they supply all the gear to keep you dry as you jet through the water. Rock Climbing - and its indoors so you won't get wet. Both finalist teams only got together in the last few days before the competition starterd. 64 teams of three entered from all over the country. Next years entry already has almost two thirds of the places taken up. The Caithness Triples has become one of the most sought after bowls competitions to enter in the last 10 years. The competition goes from strength to strength and the club captain paid tribute to the members, green keepers and the sponsors of the competition that included many local businesses. Day One Of The Caithness Triples got off to a good start and despite the poor weather in most parts of the country Caithness missed the rain even if it was cold. The competition has been running at the two clubs in Wick and one in Thurso for the first day. The competitors braved the cool weather for a good day of competition. The second day is on Sunday with finals expected to complete at St Fergus Bowling Club, Wick between 8.00 and 9.00pm. With 180 competitors from clubs all over the country the county is very busy this weekend. 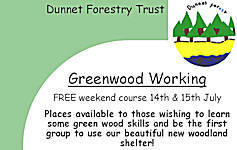 Here is a chance to help contribute to the wonderful work of the Dunnet Forestry Trust and learn some new skills at the same time. Perhaps you are thinking about a career in woodworking or want to find out more about how wood can be used or just like working outdoors. Apply soon as places are limited. Serco Sets Sail - NorthLink Ferries Service Handover Complete. Today, Thursday 5 July 2012, at 3pm Serco NorthLink Ferries officially began operating the Scottish Government contract for ferry services from the Scottish mainland to the Orkney Islands and the Shetland Islands. In Caithness the ferry "Hamnavoe" sets sail from Scrabster each day and gives great views of the west of Orkney including the Old Man Of Hoy. Managing director, Stuart Garrett, who was in Aberdeen today to meet staff and passengers as he took up his new post, took time to reassure people that for the remainder of 2012, timetables and ticket prices would stay the same. He also explained that while retaining the NorthLink brand, that customers have become accustomed to, they could also expect to see exciting improvements being announced over the coming months with plans to invest in, grow and improve this lifeline service. By the start of 2013 passengers can expect additional seating and new fully reclining seats, a refreshed catering service - including a new cafÃ© bar and restaurant - and the introduction of onboard entertainment as well as enhanced WiFi access so that passengers can browse the internet or work while they travel. New 'Shanghai Express' circus tour to bring world's most daring acrobats to Scotland - land of the brave. The sensational Circus of the Orient is coming to Scotland with a brand new tour 'Shanghai Express' - bringing some of the world's most daring acrobats and circus performers to the land of the brave. Featuring a galaxy of international circus stars from China, Mongolia, Bulgaria, Czech Republic and the United Kingdom, the new 'Shanghai Express'. Among the stars of the new 'Shanghai Express' show are the world-renowned 'Red Dragon Chinese Acrobats' who will mark their first ever appearance in Scotland by performing an incomparable array of gymnastic acts set to send audiences head over heels. From spectacular somersaults, to dazzling and dizzying acrobatics within the revolutionary Rein Wheel, this remarkable gymnastic troupe will showcase their strength and agility during a wonderful 100 minute circus show. The acrobats, from Nanle in the Henan province of China, will also perform the lavish 1,000-year-old tradition of Chinese lion dancing and a unique Oriental take on Western circus staples such as plate spinning and hat juggling.